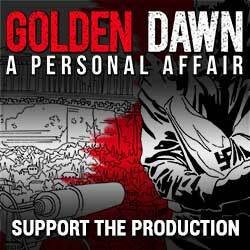 Angelique Kourounis, with courage and patience, has for years been following the activities of the Golden Dawn party. The assault squads, demonstrations, what happens in their local meetings, and especially what is in the mind of the Golden Dawner next door. The director notes that the neo-Nazi party took advantage of the crisis to attract the frustrated and those on the edge of poverty, organizing soup kitchens “for Greeks” or donations “for Greeks’. In the process she succeeds in highlighting the leadership strategy of the organization, which wants to hide its racist character and insists that “we are not racists, we are nationalists.” The revelations are shocking and concerning. Kourouni may insist that Golden Dawn is a “personal affair” for her (as her partner is Jewish, one son is gay and the other an anarchist, while she is a left wing feminist), but they certainly should concern everyone.